Improving Carcass Composition Through Selective Breeding. Nutrition and Feeding Management to Alter Carcass Composition of Pigs and Cattle. Human Nutrition and Health Implications of Meat with More Muscle and Less Fat. Human Food Safety Evaluation of Repartitioning Agents. Evaluating Lower-Fat Meats from and Ethical Perspective: Is "Good for You" Always Good for You? Technology to Assess Carcass and Product Composition. Meat Evaluation Issues and Alternatives. Strategies for Reduced Fat Processed Meats. Growth, Metabolic Modifiers, And Nutrient Considerations. The Welfare of Physiologically Modified Animals. Carcass Composition of Animals Given Partitioning Agents. Sensory Characteristics of Meat from Animals Given Partitioning Agents. Reaction of Livestock Producers to Partitioning Agents. An Overview of the Meat-Packing Industry and Some Perspectives on Partitioning Agents. Potential to Alter Carcass Composition Through Genetically Modified Animals. Immunological Approaches to Modify Growth. Index. This treatise embraces all of the various efforts to reduce fat in meat. Establishing methods such as breeding and feeding to control fatness are covered, but emphasis is on emerging technologies including meat processing and partitioning agents to reduce fat. Human implicaitons, such as health, social, ethical, and economic factors, are given special attention. Sensory charcteristics of low-fat meat, animal well being, and two new directions for the future are also discussed. 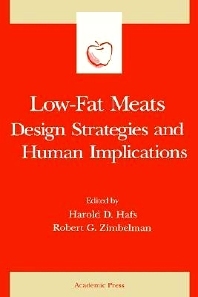 Low-Fat Meats: Design Strategies and Human Implications provides an up-to-date overview of the technologies to produce low-fat meat, with a balanced discussion of the issues. Paying speical attention to health, social ethical, and economic implications inherent in developing low-fat meats, this volume also discusses sensory characteristics of low-fat meat, animal well being, and new directions for the future. This book will be of tremendous interest to food technologists, meat pakers, purveyors, and graduate students and faculty in animal and agricultural science, food technology, and nutrition.